Matchbox Twenty and Counting Crows are two of music's most loved bands and the pair are arguably the biggest hit makers to emerge in the post-grunge era of the 90's. This year finds them joining up for a long run of dates called "A Brief History of Everything Tour 2017". When this powerful production presented by Live Nation rolled into the Bridgestone Arena in Nashville, Tennessee on August 12, 2017 it was easy to see why they've outlasted many of their contemporaries - and outshined them, too. 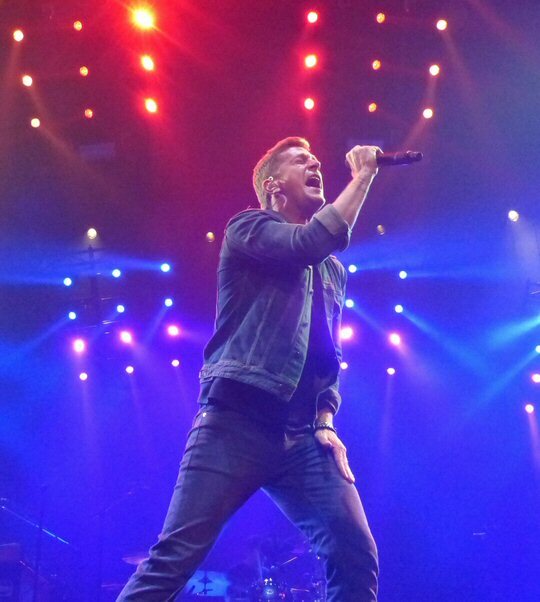 Rob Thomas of Matchbox 20 at the Bridgestone Arena in 2017. "No matter what I will ever do, nothing feels like home as much as playing these songs with these guys and it never will, "says Matchbox Twenty lead singer-songwriter Rob Thomas in a pre-tour presser. "And I can't wait to spend another summer out there on the road with the Crows." "To be honest, we took a vote after last year and decided to spend every summer with Rob from now on," says Counting Crows' Adam Duritz recalling last summer's successful 2016 co-headlining tour with Matchbox 20. "Can. Not. Wait." The wait was more than worth it as Matchbox 20 - the evening's headliners in Nashville - took to the stripped down stage with a rock solid pair of openers "Real World" and "Girl Like That". Rob Thomas and the boys were celebrating being in the business for two decades now and the denim clad lead singer still looked every inch the smooth hearthrob who helped power their ascent to the top of the charts in the late 90's. Throughout the course of their impressive set the group at times reminded us of a Springsteen U2 hybrid and twenty years on the boys have got this rock and roll thing down. Matchbox 20 at the A Brief History of Everything Tour. Their 21-song portion of the double-bill featured many highlights that were accentuated by the group's versatile and high-tech lighting rig that at one point lowered down on them shrinking the stage as it closed in on them like a cage. Having never seen the band live before we quickly learned that another one of their secret weapons was the energetic and expressive wine-chugging Paul Doucette who ran from side to side in a fashionable pink suit while providing support on guitar, vocals, keyboards and drums. "Downfall" took a unexpected turn as it veered into a bit of Dylan's "Knockin' on Heaven's Door". Later, Thomas said they couldn't come to Nashville without playing a good old fashioned cheating song and "Back 2 Good" was just as good as we remembered it to be back in the day. The Doucette penned "English Town" from their recent North album was as surprising as a Geico ad with many twists and turns along the way. Thomas thanked some of the band's mentors who were in the audience including Dave Rossi who literally pushed the guys to record "Push" their breakthrough single that help propel them to where they are today. The encore included Simple Minds' "Don't You (Forget About Me)" that found Thomas complimenting "the children of the 80's" in attendance for their sing-along skills. "3 A.M." and "Long Day" rounded things out in celebratory fashion that brought a long night of music to a satisfying conclusion in Music City. 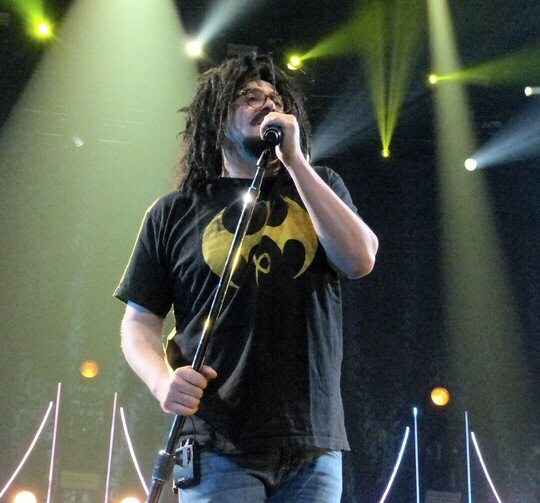 Adam Duritz of the Counting Crows at the Bridgestone Arena in 2017. We were a little concerned going in to see the Counting Crows because there was a lot of online reports detailing how Adam Duritz has gotten very "Dylanesque" in his performance style - meaning he's been more prone to talk through his lyrics than actually sing them. But, that was absolutely not the case in Nashville. The man was downright transcendent and captivating and this was the best of the three times we've had the pleasure of seeing the Berkeley-based band play live so far. Maybe it had something to do with the weather and rest as Duritz said the famed Nashville heat had nothing on their recent tour stops in Arkansas and Oklahoma and he went on to add that the group had spent the last three days in town - so they were certainly recharged on this mid-tour date that will find the high powered pairing continuing on the road through the beginning of October. 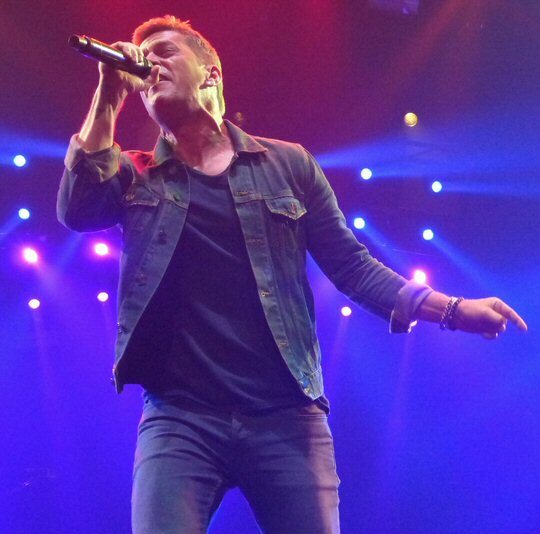 Perhaps sharing the spotlight with a dynamic frontman like Rob Thomas has been an inspiration. Whatever the case Duritz and the boys brought the good stuff to Tennessee on this night. In addition to Adam the stars on this night were the Counting Crows themselves who have perfected a form of dynamic roots rock that makes for good theater. 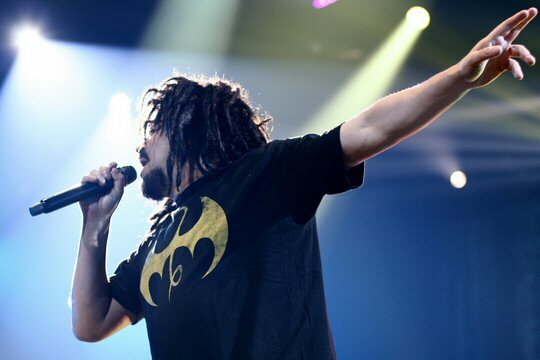 Duritz was in good voice and remained expressive and immersed in the music putting a lot of hand gestures into the mix underscoring the group's often melancholy and mysterious music. On the three pack of "Round Here", "A Long December" and "Mr. Jones" the guys employed some tried and true techniques like a slow build and dramatic pauses to great effect. A trip to the meandering "Palisades Park" and the downpouring of "Rain King" in the encores washed away all doubt - the Counting Crows can still high fly when they need to. Counting Crows at the A Brief History of Everything Tour. 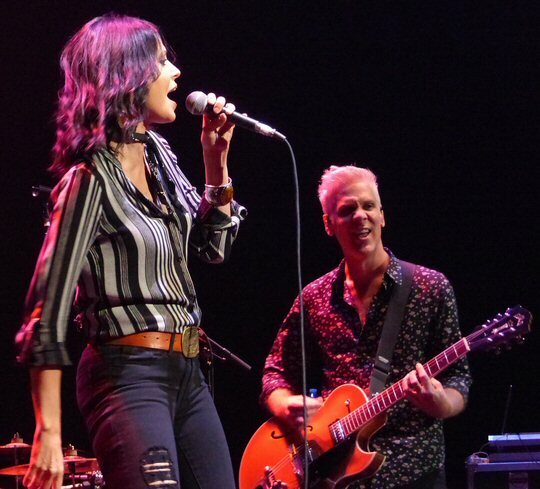 Opening act Rivers and Rust found Matchbox 20 guitarist Kyle Cook doing double duty as he paired up with Nashville Star veteran Sheila Marshall. The two led their group through a number of crowd-pleasing selections that were a raw mix of soul, rock and Americana. Cook, now a Nashvillian and Sheila the sultry Texan fronting the band had an impressive chemistry and solid songs that are slated to soon see the light of day. The Bridgestone Arena in the heart of downtown Nashville is an award-winning arena and is home ice for the Predators. It also hosts a wide array of sporting and musical events such as Matchbox 20 and Counting Crows. Upcoming events at the venue include Guns N' Roses, Foo Fighters, Chris Stapleton, Katy Perry and more. Rivers & Rust got the long night of music flowing in Nashville.